Atlas ATM: We place and operate ATM machines at your business with no cost to you ! Atlas ATM pays for the ATM Machine. Atlas ATM pays for the installation of the dedicated telephone line for the ATM. Atlas ATM pays for the monthly Telephone Bill. 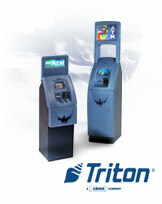 Atlas ATM pays for the installation and all related costs of the ATM. Atlas ATM pays for all Service and Maintenance of the ATM. Atlas ATM pays for all signage for the ATM. The client needs to decide if Atlas ATM or the client will be replenishing the cash for the ATM. The Client needs to decide where to place the ATM. The Client supplies the Electric for the ATM. Atlas ATM must anchor the ATM to the building by whatever means are agreeable to Atlas ATM and the Client.